To honor the vision and unselfish actions of our Kasaan Haida ancestors and elders, Kasaan Haida Heritage Foundation aims to document, preserve, and promote those things that make the Kasaan Haidas unique. PURCHASE A NAAY I'WAANS REDEDICATION DVD! The Organized Village of Kasaan is selling DVDs of the Naay I'waans Rededication which was held in Kasaan on September 3, 2016. The DVDs are selling for $20.00 plus $2.00 shipping and handling if they are going to be mailed. If you are interested in purchasing a DVD please contact Nannette Scamahorn either via OVK office (907-542-2230) or email nannette@kasaan.org. Kasaan Haida Heritage Foundation (KKHF) is a Native nonprofit organization founded for the Kasaan Haida people of Southeast Alaska. KHHF was established in 1999 by Kavilco Incorporated, a village corporation within the Southeast Alaska region formed under the Alaska Native Claims Settlement Act (ANCSA), with three members of Kavilco’s Board of Directors serving as officers: Kenneth Gordon, President; John Campbell, Vice President; and Jeane Breinig, Secretary/Treasurer. Laird A. Jones has served as KHHF President since 2001. The concern was clear that an effort should be made to document and preserve our Kasaan Haida culture. There are many projects important to the cultural heritage of Kasaan Haida people: clan house and totem pole restorations, Haida language perpetuation, repatriation of Kasaan artifacts, videotaping and interviewing our Elders, and cleaning up the creeks near Kasaan for the return of salmon runs. Because of the increasing age of our Elders, KHHF raised funds for an Oral History Interview Project. With a grant from the Alaska Humanities Forum and generous monetary and in-kind donations by Kasaan Haida descendants, we completed the Kasaan Haida Elders Speak project in 2002. We received additional support from Sealaska Heritage Institute and the Organized Village of Kasaan (OVK). In spite of the passing of many Elders interviewed then, we continue our ongoing efforts to record and preserve our Haida language and stories. Our current priority is the restoration of Náay I’waans/Chief Son-I-Hat's Whale House and Totem Park, listed in the National Register of Historic Places in 2002. Because of a lack of maintenance by the U.S. Forest Service since the early 1940s, the Whale House and totems have fallen into disrepair. Steady deterioration seriously threatens the only remaining Haida clan house in Southeast Alaska. We are seeking grants and other funding in order to return the Whale House to a sound condition. As a registered nonprofit organization, KHHF can offer a tax deduction for monetary and in-kind donations. 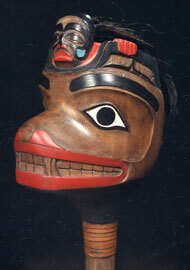 THE RATTLE Wolf Clan Shaman's Dance Rattle carved in 1974 by Kavilco Vice President Louis Jones, Sr. The Shaman is depicted between the ears of the wolf. Mr. Jones visited the Royal British Columbia Museum in Victoria, BC with images of the rattle he had created. The museum showed him one that was very similar in their collection. The Rattle is made from yellow cedar and is filled with beach stones. The Shaman has black hair that was contributed from Mr. Jones’ own head "gray hair, dandruff and all." A little history about the Rattle from Mr. Jones: Sometime after he had completed the Rattle, his old dog Buck got hold of it and destroyed the handle (Buck was only a puppy at the time). After Mr. Jones and Buck had both recovered, Mr. Jones took a band saw and removed what was left of the handle, just below the jaw, and rebuilt it with a new handle.